Running wild and relatively unexplored, Namdapha National Park in Arunachal Pradesh hosts an amazing variety of wildlife and plant species. Capturing our attention on this trip, however, were the lively, vibrant butterflies that thrive within this dense tropical rainforest. In March this year, I visited Namdapha for the first time. Like any other trip to this part of the country, this one had me greatly excited. Northeast India is a paradise for any naturalist, with its amazing diversity of flora and fauna, accompanied by breathtaking landscapes. All my previous trips to the northeast have been about bird watching, but this time around I was keen on observing and photographing the region’s other winged residents—its numerous butterflies. Namdapha, a national park and tiger reserve, is truly wild. Lush green vegetation and impenetrable forests are spread over an area of about 2000 sq km. Located in the Changlang district of Arunachal Pradesh, it lies close to India’s border with Myanmar. The sprawling rainforests cover the misty blue hills of Mishmi and Patkai ranges and extend up to the banks of the turbulent Noa Dihing River. Namdapha was declared as a Tiger Reserve by the Government in 1983. About 135 km from Tinsukia in Assam, the journey to Miao—the town at the entrance of Namdapha Tiger Reserve—has to be covered by road. Another 28 km from here will take you to the Forest Department-run tourist complex at Deban, inside the park. Deban is set on the banks of Noa Dihing, a tributary of the mighty Brahmaputra. I remember seeing the mist rising from the valleys on the very first morning; the weak sunrays were trying to shine through, to the soundtrack of several gibbons, laughingthrushes and barbets. Travelling to such a remote corner of the country seemed worthwhile if only to see such a glorious sunrise each day. 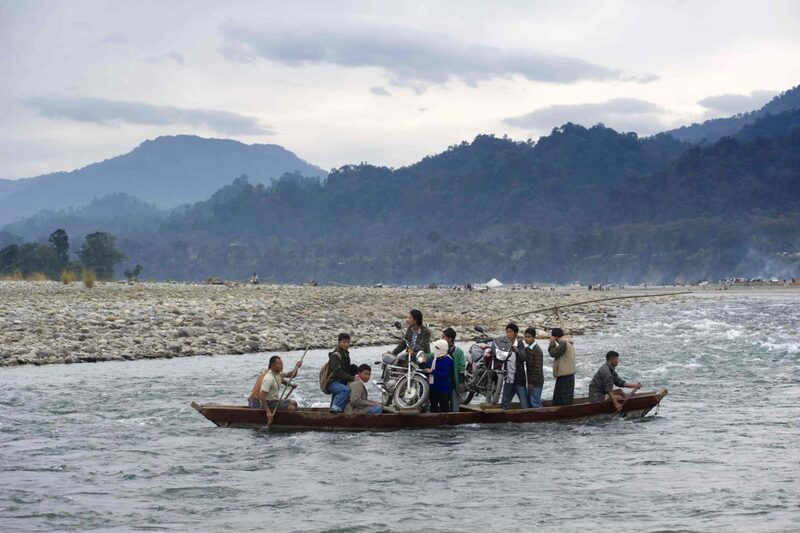 Passengers crossing the Noa Dihing river using the ferry boat service in Miao. I was accompanying Hemant Ogale and Rohan Lovalekar, both leading butterfly experts from India in their own right. My visit was for six days, which quite frankly, felt too short. But in that seemingly little time, I gained an incredible amount of knowledge about these tiny forest jewels. 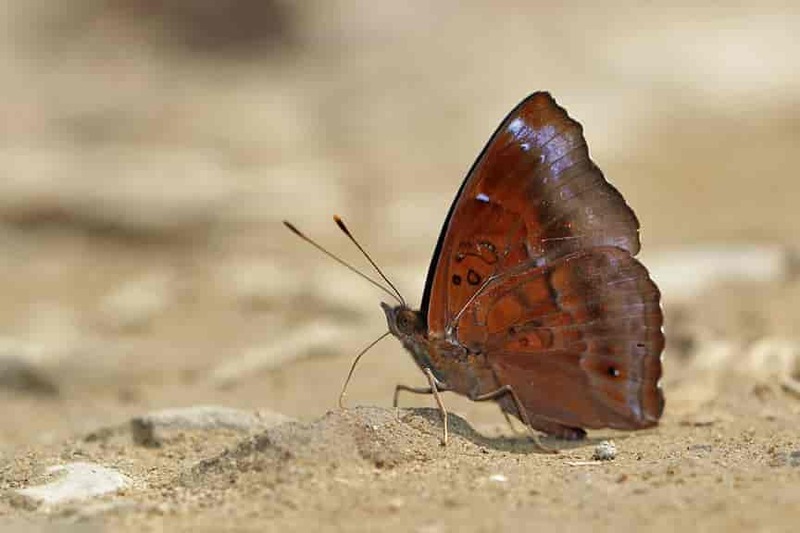 While I learned to recognise and identify butterflies as we spotted them, I also discovered fascinating facts about their feeding behaviour, mud-puddling, sexual dimorphism and effect of the climatic conditions on butterflies from my two companions. There are several places, all with rather unusual names, to visit around Deban. Haldibari, Hornbill Glade, Bulbulia, Rani Jheel, Firmbase, and Anamika Waterfalls are some of them. Our first day was a little disappointing as we did not see many butterflies, mainly due to the cloudy weather. But the following days proved to be much better and we returned with an impressive list of 150 species within the week. The very first butterfly we spotted was the Dark Judy (Abisara fylla), a common butterfly in this area, but new to me. As the days passed by, I saw several ‘new’ butterflies, like the Himalayan Popinjay (Stibochiona nicea nicea) and the Himalayan Punchinello (Zemeros flegyas flegyas). Amongst the most exciting of my sightings there, was one of the Narrow Indian Awlking (Choaspes benjaminii japonica). We were photographing butterflies at a mud-puddling site when suddenly this shimmering green beauty landed right in front of me! Another thrilling sighting was that of the Continental Nonsuch Palmer (Creteus cyrina cyrina). This butterfly, in fact, is so rare that we couldn’t identify it on the spot and had to wait till we got back and cross-referred with several books. 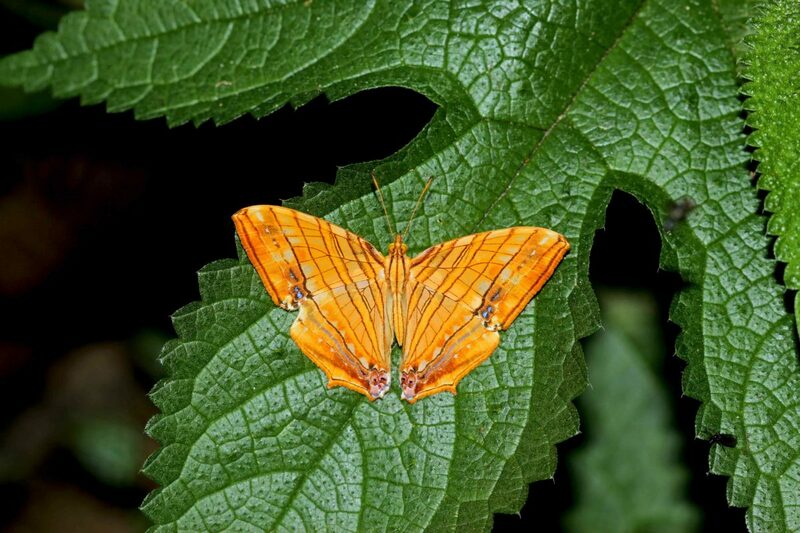 Also spotted was the Himalayan Dull Forester (Lethe gulnihal gulnihal), a dull-coloured butterfly, preferring to stay near bushes and under thick forest cover. But undoubtedly, the Himalayan French Duke (Euthalia franciae franciae) was one of the most spectacularly coloured butterflies I saw on the trip. On our last day at Deban, with just a few hours remaining to go, we decided to do one quick trail in the forest. As we walked along the bushes to the main gate of the complex, Rohan, who was lagging behind, started calling us excitedly. Hemant and I rushed to the site to find him chasing a very slow-flying butterfly. Usually, butterflies perch on the top side of a leaf when they stop to rest during flights, but this one would hang below the leaves. After a long chase (of over an hour!) we managed to get some photos of the butterfly, which we later identified as a Malayan Columbine (Stiboges nymphidia nymphidia), a very rare species. As we packed our bags before leaving Miao, I grabbed one last look over the Noa Dihing River. As a naturalist, I am quite aware of the importance of butterflies in an ecosystem. From being an important part of several food chains to performing more complex duties, like pollinating flowers—nature simply cannot do without butterflies. But I never imagined that these flutters, ephemeral species could have such deep an impact on the human heart as well. Butterflies get most of their nourishment from flower nectar. Nectar, although rich in sugars, is poor in salt and mineral content. Many butterflies need more salt than what is provided by their nectar diet. Minerals are also vital for reproduction in butterflies. 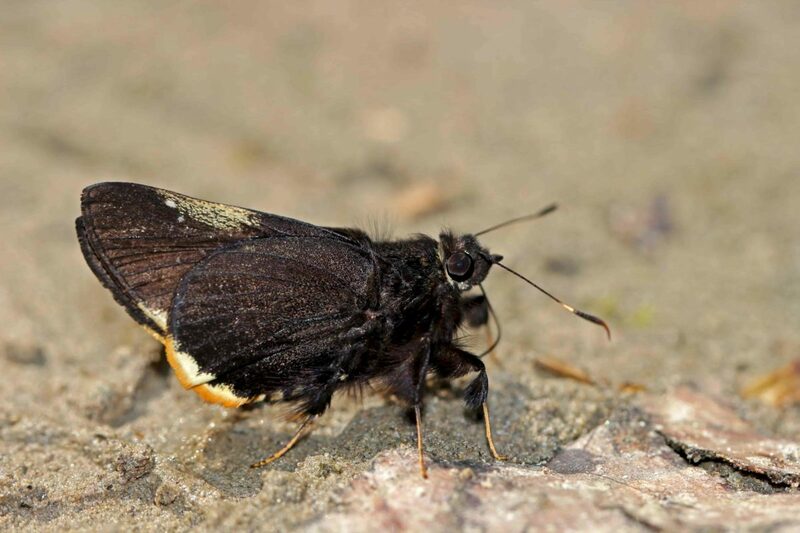 To overcome this shortage, butterflies visit damp soil patches to ‘lick’ the minerals present in the water. This behaviour is known as ‘mud-puddling’. Alternately, butterflies have also been observed taking salts from human sweat, dung, rotting fruit and even carcasses. In some species, only males visit mudpuddling sites and the minerals collected are passed on to the female as a nuptial gift during mating. Varun Satose has completed his Master’s in Environmental Science and is currently a PhD student, studying the bio-active proteins present in the venom of the Malabar Pit Viper. He has a special interest in reptiles, birds and butterflies and likes to travel to places well-known for their biodiversity.